Oklahoma State University’s OKstate Racing team set a new 24-hour mileage and endurance record at the Hallett Racing Circuit again this year with their compressed natural gas (CNG) powered Formula race car, completing 428 laps by Monday morning, or 100 more laps (180 miles – 290 kms) more than the record that was set last year.“Our improved tuning put more power to our suspension. We fought suspension failures all 24 hours, but we persevered. What a team!” said Jim Beckstrom, OKstate Racing team adviser, who is also thanking all those who supported the program this year. The team went a total of 770 miles (1,239 kms) in the 24-hour period. By doing so, the OKstate team is attempting to prove that CNG is a practical and high-performance transportation fuel. 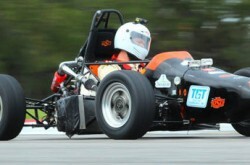 The team hopes that CNG will eventually become accepted as a fuel in international Formula SAE competitions. Just last year, the team’s car became the first of its type ever converted to run on natural gas to go 24-hours. Open to all majors, OKstate Racing is a student club that builds a formula race car from the ground up each year and takes it to international competition. The club’s CNG program is believed to be the only one of its kind in the world, and is an extension of its already rigorous competitive program. It is a Society of Automotive Engineers organization sponsored by the School of Mechanical and Aerospace Engineering in the College of Engineering, Architecture and Technology at OSU.